In the not too distant future, the world has finally succumbed to the change in temperature and can longer sustain human life. 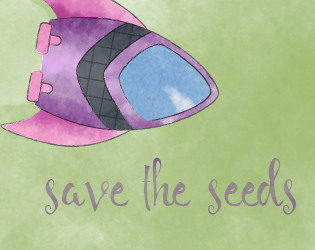 Your mission, if you choose to accept it, is to re-enter the atmosphere and retrieve seeds from different biomes in the hope of resurrecting the plants of days gone by and slowly restoring the earth to its former glory. Currently this only features two biomes, a temperate deciduous forest and a desert. The forest is based in the south west of England, saving the county flower of Devon and including patterns of this region, so it hits that diversifier. This may not be immediately relatable to anti-authoritianism, but certain politicians seem to not think this is terribly important, when it really really is. And it's a huge problem that threatens everyone in the world. I have plans to expand this game and make more biomes, I have plans and mechanics for a couple more and I'd love suggestions of future levels.